In 1992, the opening of Orioles Park at Camden Yards ushered in a new golden era of baseball architecture influenced and inspired by stadium designs of the early 1900s. The building and the concept behind it has influenced nearly every ballpark that has followed. For only $9 per person, we received one of the best and most thorough stadium tours we’ve ever taken – sports or otherwise. Our tour guide Mike, a lifelong Baltimorian and Orioles fan, met us in the gift shop and immediately took us upstairs to one of the park’s luxury suites. From this tall vantage point we were able to see a number of innovations, unique at the time to Camden Yards. The field dirt is not dirt, it is, in fact, sand. While the sand makes grass hard to maintain, it drains much better than traditional dirt, reducing the length of rain delays and almost eliminating rainouts. 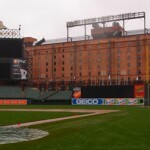 Center field is home to the Orioles sod farm. In light of the fact above, sod is actually planted and grown behind the fence in centerfield to reduce the cost and maintenance of the sand field. The warehouse in right field is original to the area and was a highly debated design element for the new ballpark. The warehouse, originally a storage warehouse for the Baltimore and Ohio railroad, was in serious disrepair home to vermin and in need of substantial renovation. The city wanted to remove the building to provide ballpark visitors with a wonderful view of the the famous inner harbor, hoping the view would encourage visitors. The Orioles design team however, wanted the enclosed downtown feel of an old-time ballpark. The Orioles, of course, won out and now, the warehouse has become one of the most adored elements of park, offering the Orioles an administrative center, customers retail and restaurant space and private office space for the city’s well-to-do businesses. They were also the first club to offer the club seating benefits enjoyed by fans in other markets. Spectators seated in the club level have waitress service and access to many of the amenities of the high-class, and expensive luxury boxes. The tour takes you through some areas of the stadium usually closed to fans including the press box, control room and even the Orioles dugout. In the press box, you get a bird’s eye view of the field and interesting stories about the dangers (think line drive foul balls without a safety net) of being a baseball reporter in this old-time box. While, in the control room, you see just how many people and how much equipment is needed to present the major league baseball product to the visiting crowds. The main event however, is the chance to get the privileged view of Orioles greats like Cal Ripken and Eddie Murray. The dugout is where most of baseball’s intimate strategy is dictated and designed, from calls to the bullpen to lineup and fielding changes. You get the chance, if only for a few moments, to fantasize about chance at the plate, and what it must feel like to walk out onto the field to 40,000 screaming fans. As a former amateur ballplayer, this is the opportunity of a lifetime. If you’re ever in Baltimore, we highly recommend a visit and tour of the park.